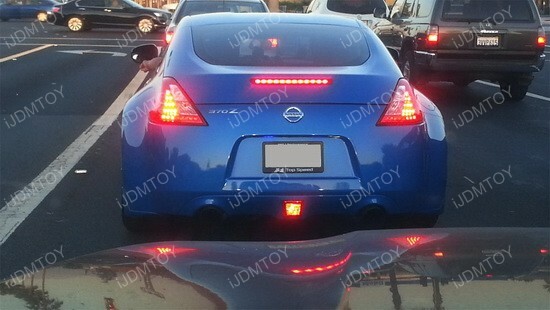 This LED rear fog light is compatible with the 370Z, Scion FR-S, and Subaru BRZ so if you’re lucky enough to own one of these cars, then one of the first mods you should consider is the rear fog light upgrade. While there is no denying that the LED 4th brake light looking amazing on the Scion FR-S/Subaru BRZ, it also looks great on the 370Z too! The easy DIY conversion kit helps you convert the bulb-less rear reflector to change it up to a rear reflector with more lights. You would have to do some light LED light retrofit mods, like drilling and tapping wires, but that’s completely doable and not much work when you think of how great the final result would look. Maybe next time we’ll be just as lucky and see more cars out there that got their lights from us. 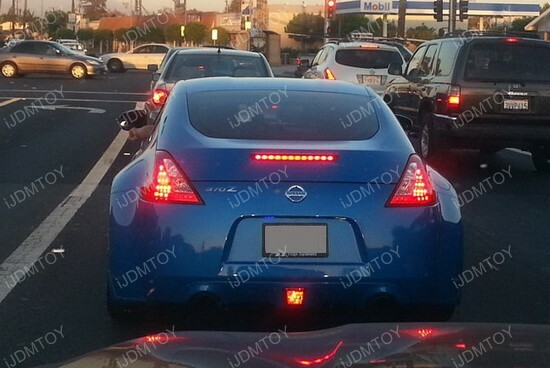 This entry was posted in - LED & HID Updates, Nissan, Scion, Subaru and tagged 370Z, aftermarket, car parts, cars, Eat Sleep JDM, Fairlady, Fairlady Z, fog light, HID, iJDMTOY, JDM, JDM Culture, LED, Nissan, Nissan 370Z, Nissan Fairlady, Nissan Fairlady Z, rear fog light by Shari. Bookmark the permalink.